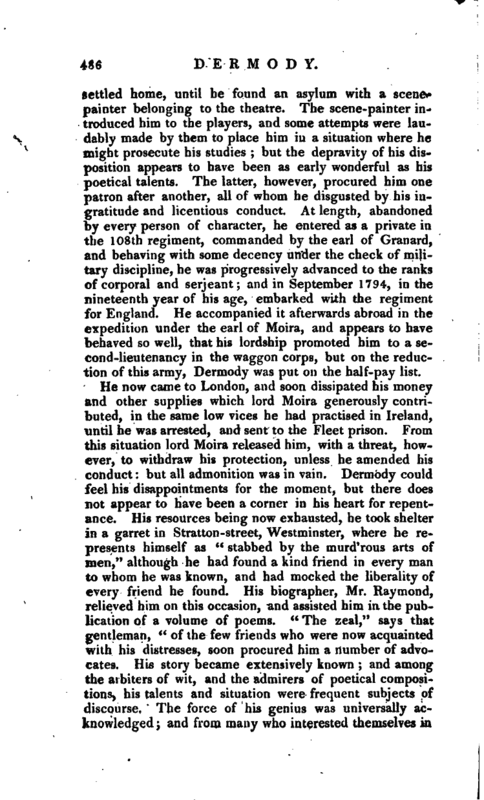 , a young man who acquired a short-lived reputation as a poet, was born in the south of Ireland, January 1775. 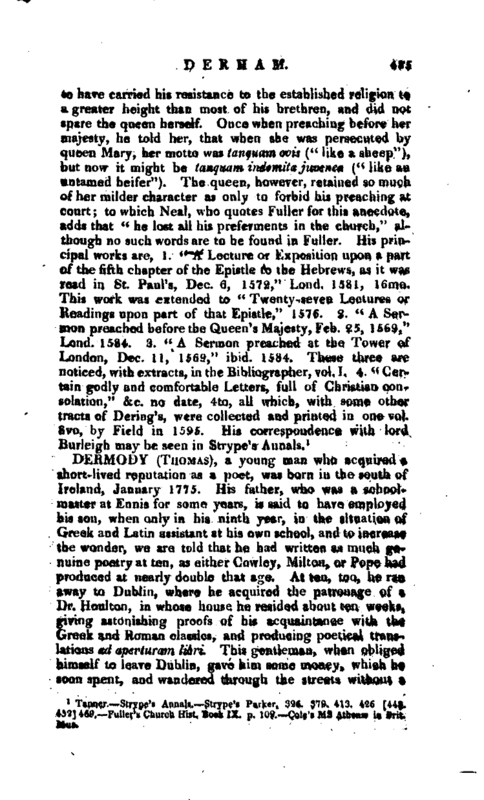 His father, who was a schoolmaster at Ennis for some years, is said to have employed his son, when only in his ninth year, in the situation of Greek and Latin assistant at his own school, and to increase the wonder, we are told time he had written as much genuine poetry at ten, as either Cowley, Milton, or Pope had produced at nearly double that age. At ten, too, he. ran away to Dublin, where he acquired the patronage of a Dr. Houlton, in whose house he resided about ten weeks, giving astonishing proofs of his acquaintance with the Greek and Roman classics, and producing poetical translations ad aperturam libri. 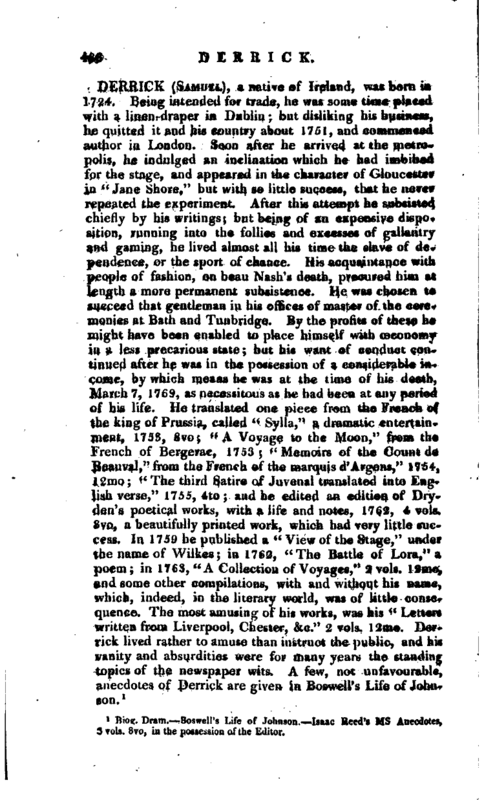 This gentleman, when obliged himself to leave Dublin, gave him some money, which he soon spent, and wandered through the streets without a | settled home, until he found an asylum with a scene-­painter belonging to the theatre. The scene-painter introduced him to the players, and some attempts were laudably made by them to place him in a situation where he might prosecute his studies; but the depravity of his disposition appears to have been as early wonderful as his poetical talents. The latter, however, procured him one patron after another, all of whom he disgusted by his ingratitude and licentious conduct. At length, abandoned by every person of character, he entered as a private in the 108th regiment, commanded by the earl of Granard, and behaving with some decency under the check of military discipline, he was progressively advanced to the ranks of corporal and serjeant; and in September 1794, in the nineteenth year of his age, embarked with the regiment for England. He accompanied it afterwards abroad in the expedition under the earl of Moira, and appears to have behaved so well, that his lordship promoted him to a second-lieutenancy in the waggon corps, but on the reduction of this army, Dermody was put on the half-pay list. He now came to London, and soon dissipated his money and other supplies which lord Moira generously contributed, in the same low vices he had practised in Ireland, until he was arrested, and sent to the Fleet prison. From this situation lord Moira released him, with a threat, however, tp withdraw his protection, unless he amended his conduct: but all admonition was in vain. Dermody could feel his disappointments for the moment, but there does not appear to have been a corner in his heart for repentance. His resources being now exhausted, he took shelter in a garret in Stratton-street, Westminster, where he represents himself as “stabbed by the murd’rous arts of men,” although he had found a kind friend in every man to whom he was known, and had mocked the liberality of every friend he found. His biographer, Mr. Raymond, relieved him on this occasion, and assisted him in the publication of a volume of poems. “The zeal,” says that gentleman) “of the few friends who were now acquainted with his distresses, soon procured him a number of advocates. His story became extensively known; and among the arbiters of wit, and the admirers of poetical compositions, his talents and situation were frequent subjects of discourse. The force of his genius was universally ac-r knowledged; and from many who interested themselves in | his behalf, he reaped more solid advantages than praise and admiration. But neither poverty, experience, nor the contempt of the world, had yet taught him prudence: he had no sooner excited their compassion, and profited by their generosity, than he neglected their advice.” He thus went on from one scene of low depravity to another, until his constitution was undermined; and at length, wasted with disease, the consequence of habitual intemperance, he died at an obscure hovel near Sydenham, July 15, 1802, in the twenty-eighth year of his age. Such are the outlines of a life which his biographer has extended to two volumes, of considerable size, without affording a period or an incident on which the mind can dwell with any pleasure. The whole, indeed, forms a most disgusting picture of early and uniform depravity, a character wholly formed of shade, and comparable to nothing we remember. 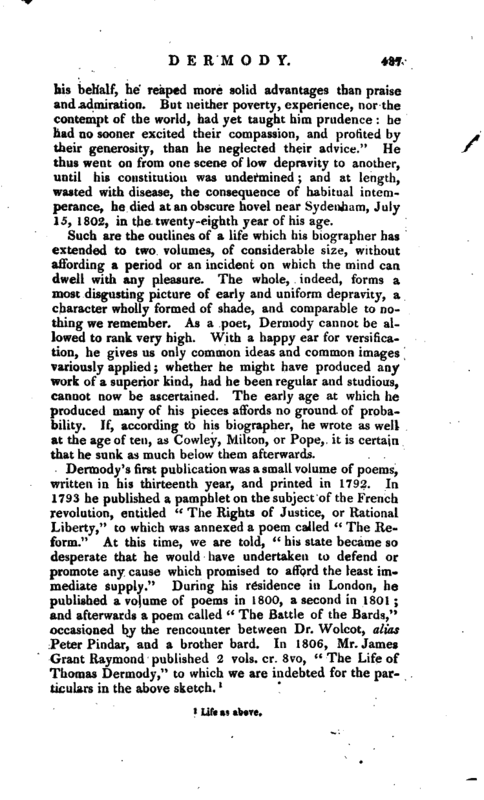 As a poet, Dermody cannot be allowed to rank very high. With a happy ear for versification, he gives us only common ideas and common images variously applied; whether he might have produced any work of a superior kind, had he been regular and studious, cannot now be ascertained. The early age at which he produced many of his pieces affords no ground of probability. If, according to his biographer, he wrote as well at the age of ten, as Cowley, Milton, or Pope, it is certain that he sunk as much below them afterwards.